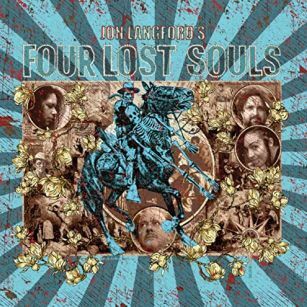 The visual artwork of Jon Langford (The Mekons,The Waco Brothers) led to the recording of his latest release, Four Lost Souls. Jon had produced images for the Dylan, Cash, and the Nashville Cats: A New Music City exhibit at the Country Music Hall of Fame. One of the infamous ‘Nashville Cats’, bass player and producer, Norman Putnam, invited Jon Langford down to his Muscle Shoals to his Nutthouse Studios. One year later, Jon traveled to Alabama to record Four Lost Souls in four days, backed the players that put Muscle Shoals on the map with their work at the cities recording studios. Members of The Swampers, David Hood and Randy McCormick, joined other A-list locals and Jon’s Nashville sidemen, Pete Finney (Pedal Steel) and Grant Johnson (guitar) on Four Lost Souls. Traveling down from Nashville on a guitar jangle, Jon Langford cruises the “Natchez Trace”, sways in the Southern Soul of “Mystery”, lets Blue Eyed Dan skip to the beat through “Half Way Home”, and tunes the dial to sad whispers for “Poor Valley Radio”. Jon Langford uses his pen like a paintbrush as he draws life into his characters with a clear understanding of their ways as they walk through the stories. “In Oxford Mississippi” namedrops favorite son William Faulkner, as a sturdy beat supports “Indestructible”, and gospel keyboards shine a light on a glorious life in “I Thought He Was Dead”. The ghosts of the South walk the halls of Four Lost Souls looking for the late-night pharmacy in “Waste” that is ‘open ‘til four’ and watch the day turn dark as “Snake Behind Glass” opens up its ‘guitar case full of amphetamines’ as Jon Langford displays “Masterpiece” on majestic melodies, asks “What’s My Name” on a rock’n’roll beat and admits “I Felt My Courage Fail” as he searches for answers and omens.